If the language you want to use for your site is not available, you can create the translation yourself. To do this, download the Poedit software for free from the Poedit website. They also offer a paid version specifically for WordPress, but you only need to download the free version from their homepage. If you translated the theme in your language and want to share the translation with the community, just submit a ticket and we will include it in the next update. Thank you so much for your contribution! 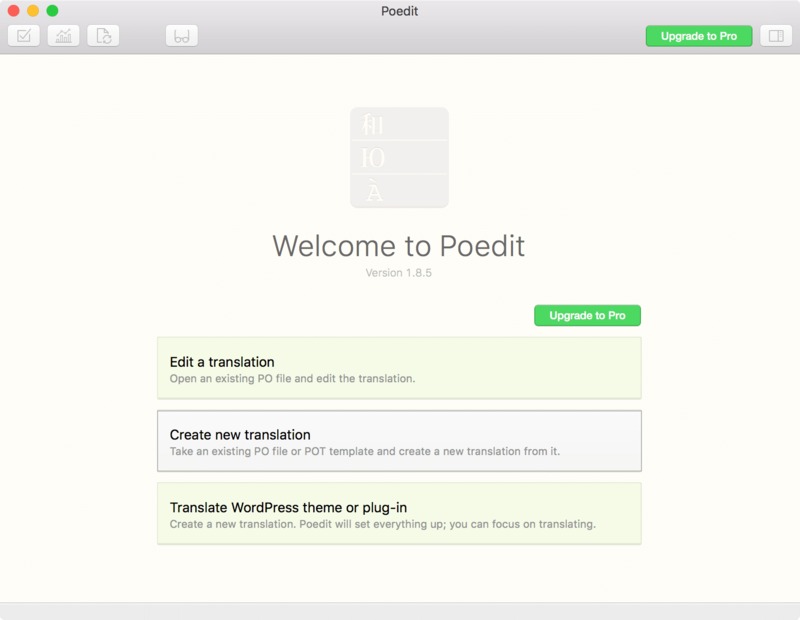 Once you've downloaded and installed PoEdit, launch it and click Create new translation. The main screen in Poedit, with the Create new translation button highlighted. Open the .pot file found in your theme's languages/ directory. Opening a file in Poedit. Select the language of your translation. 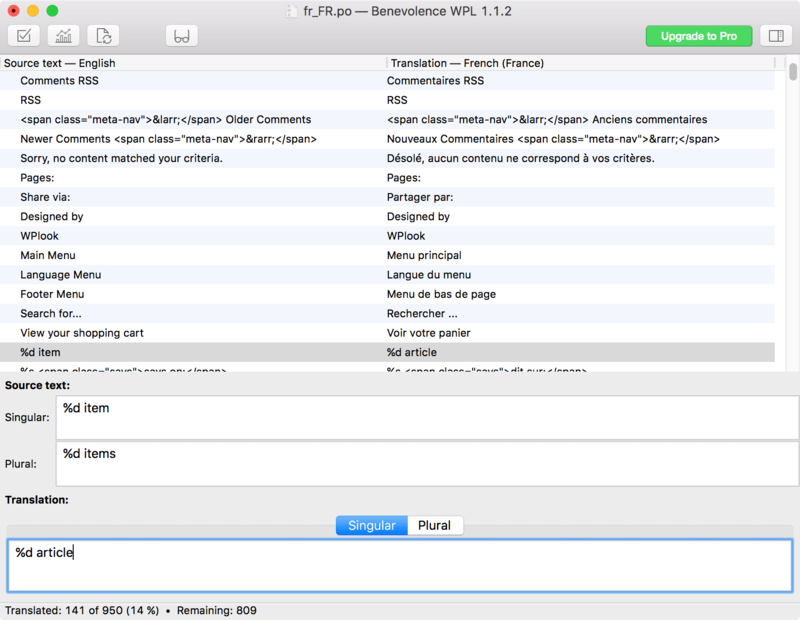 Selecting the translation language in PoEdit. Go to File → Save As... and save the file in the theme's languages/ directory using a filename taken from the WP Locale column of the Translate WordPress page. 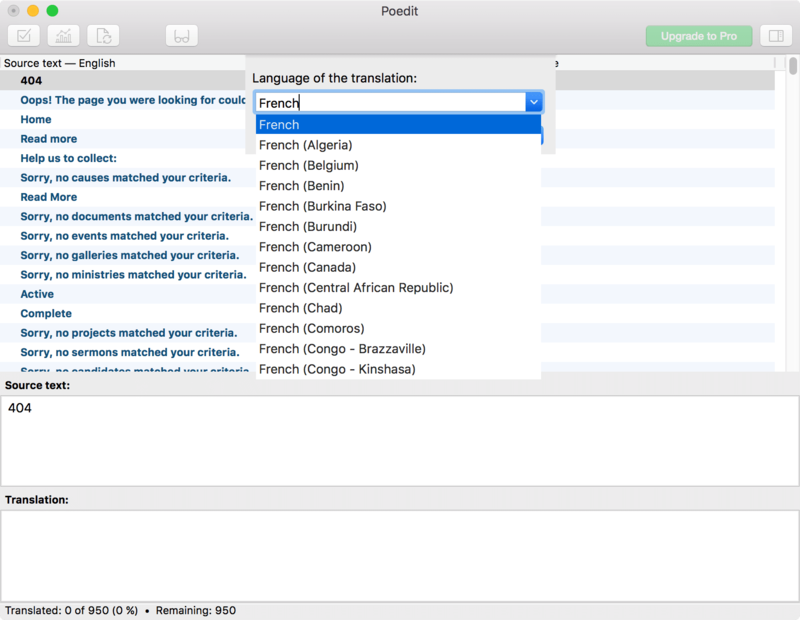 For example, if your site is set to French, use fr_FR.po as your filename, or if your site is set to a more specific language, like English (UK), use en_GB.po. Translate each of the strings in the top window by typing it's translation into the text area at the bottom of the window. Poedit, with some of the strings translated. The status bar at the bottom shows how much of the file has been translated. You might encounter some strings which contain things like %d, %s, or %1$s. These are simply placeholders for non-static items, such as dates or numbers. Strings may also occasionally contain HTML. Copy these exactly into the translated phrase in the appropriate place. Poedit, showing a string using both a placeholder and HTML. Some strings, usually those including placeholders, include context, so you know what the placeholders represent and you can translate it so it makes sense in your language. This is displayed above the Source text textbox. A Poedit window, with translation context highlighted. You might also encounter strings which include singular and plural versions. 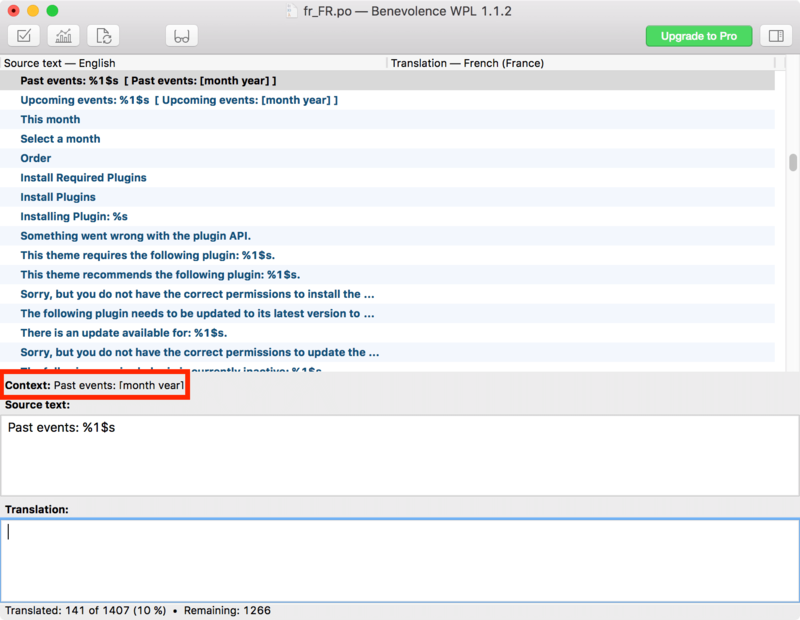 Click the Singular or Plural tabs in Poedit to edit the respective versions of this string. Poedit, displaying a singular version of a singular/plural string. 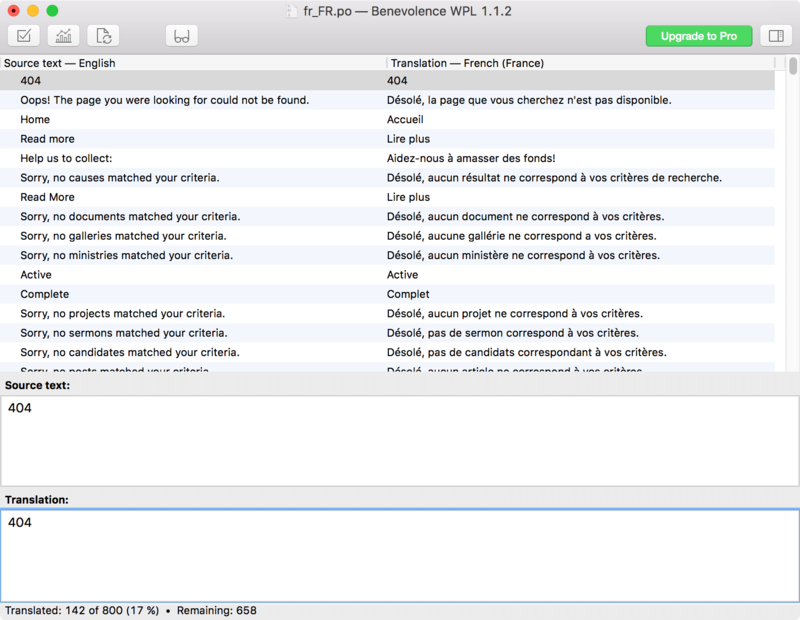 Once you've finished your translation, export your translation as a .mo file. To do this, go to File → Compile to MO.... Save this alongside your original translation file, using the same language code, resulting in a name such as fr_FR.mo. 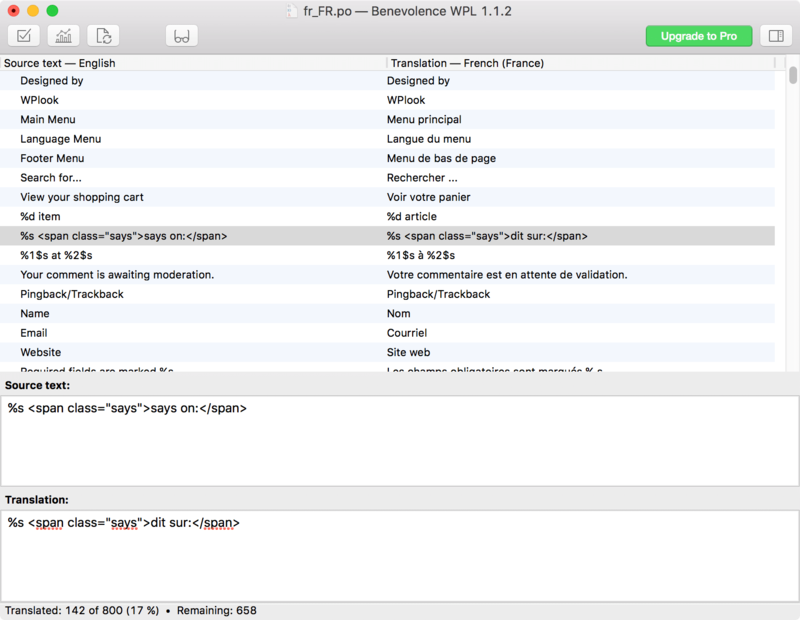 To enable your translation in WordPress, follow the steps in Configuring Site Language. If you've done a translation for a previous version of the theme, you will need to update it when theme updates are released. Nearly every theme update adds new strings or removes obsolete strings. 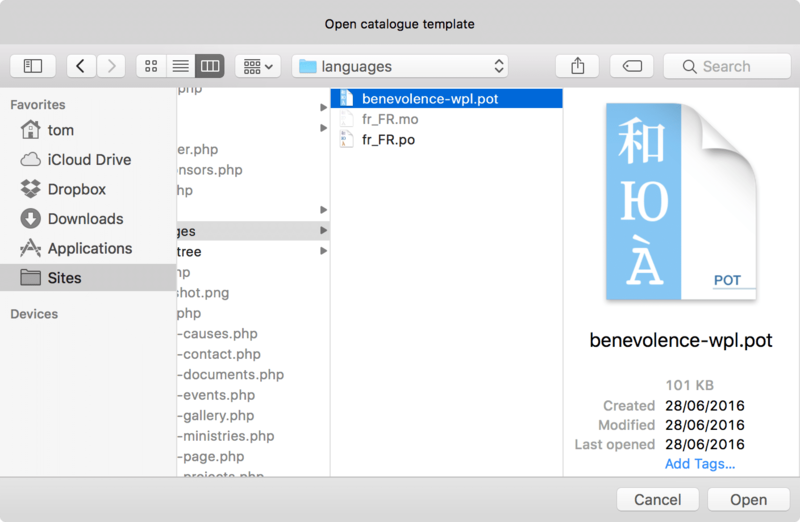 To do this, open your existing .po file and go to Catalogue → Update from POT File... and select the .pot file from the latest version of the theme.